For much of my life I have had severe confidence issues, but, from what I remember of primary school, I wasn’t always like this. There was a time when I was confident and rambunctious, whether that meant playing the main role of Babushka in a school play at seven years old or deciding it would be a good idea to dance to ‘Low’ by Flo Rida in front of my entire class – and I still cringe whenever I hear that song. But over time my confidence was chipped away. Perhaps my younger self wasn’t so cognisant of my surroundings, so aware I was different. But as I got older I started growing at a much faster rate compared to the rest of my peers. Having a growth spurt at around seven years old meant I was the tallest in my year group, taller than both the girls and the boys who had to stand on chairs so they could be height level in school photographs. Starting puberty at eight years old meant the rest of my body soon looked different to the girls around me. I was so scared when I started my period, as we had not learnt anything about that in school, I thought I was going to die because my wee “looked purple”. It also didn’t help that I was the only black person in my entire class. As my hips grew larger, my tummy larger and my chest bigger, boys started to notice. Not in the over-sexualised way that black women have had to deal with for centuries, most prominently depicted in the exhibition of Sarah Bartmann, but in an aggressive way where I was constantly laughed at for the shape of my body. As I got older this unsure sense of myself grew larger and larger, and I often grew paranoid about whether people were laughing at me or didn’t like me. I craved desperately to fit in. I would find myself sometimes “performing blackness” too, welcoming my classmates’ assumptions that I knew how to twerk and how to rap. But I still always felt I was on the periphery, on the outside of friendship groups and looking in. I’ve now been able to come to terms with some of these issues. Although they have not entirely faded, I am able to assert myself more and actively pursuing activities I enjoy, like writing for gal-dem. It was through these opportunities I was able to get an internship at The Sunday Times Style. I had never done any fashion related internships before despite craving a career in fashion when I was younger. At one stage I even emailed Shelly Vella, then Fashion & Style director at Cosmopolitan, for advice, but this dream died as I let my low self-esteem destroy it. I was so excited to undertake this internship and am honestly so grateful. Not only did I get to meet other interns who came from all sorts of walks of life and, for the most part, were so gracious and lovely, but I got to learn so much about the fashion industry. I was able to learn how fashion editors decide which brands and clothes they want to shoot, and even got to order clothes from designer brands for shoots. I’ll never forget how it felt to have a package filled with designer bags addressed to me! From the contacts I established at The Sunday Times I was able to get the contact information of a fashion assistant at Cosmopolitan and then an internship there– the magazine I had dreamt of working at since I was a teenager. At Cosmopolitan I did similar tasks, but was granted even more responsibility; I would also order a variety of items for their Christmas Gift Guide and re-organise the fashion closet. Everyone at Cosmopolitan was so lovely, and even though I was sometimes worried that I hadn’t done a good enough job, I got amazing feedback from the rest of the team. During that time I mentioned to one of the team that I had never been on the set of a fashion shoot before and would be keen to go on one. Unfortunately the opportunity never arose and after my internship I said my goodbyes, celebrated my birthday, and started getting ready to go back to university. A couple of weeks passed then the most amazing thing happened: some of the team got back in touch with me to ask me whether I would like to feature in a shoot. A whole me? I was speechless, and kept reading and re-reading the email to make sure I hadn’t misunderstood. But I hadn’t. They really wanted me to model for them – a whole big chested, wide hipped, big stomach – me. I still couldn’t believe it when I turned up to the shoot and got my makeup done by a fantastic black makeup artist, my hair done by a kind stylist and my photos taken by the brilliant Rosaline Shahnavaz. I was surrounded by professional models and heavyweights in the industry, and I had to pinch myself at times to believe I was really there. I had to pinch myself on the way home as well, as due to my confidence issues I had been worried none of the clothes would fit me or I would not know how to pose or how to model, and my pictures would be scrapped. But again, my worries were unfounded, and the fashion editor even commented that I was one of the best models on the shoot. When my issue came out on 1 December I screamed and ran down the street to the Co-op, paid £3 and flicked through the pages. I saw my photo and I cried. I cried of happiness as I, for once, finally looked at myself and thought I looked beautiful. 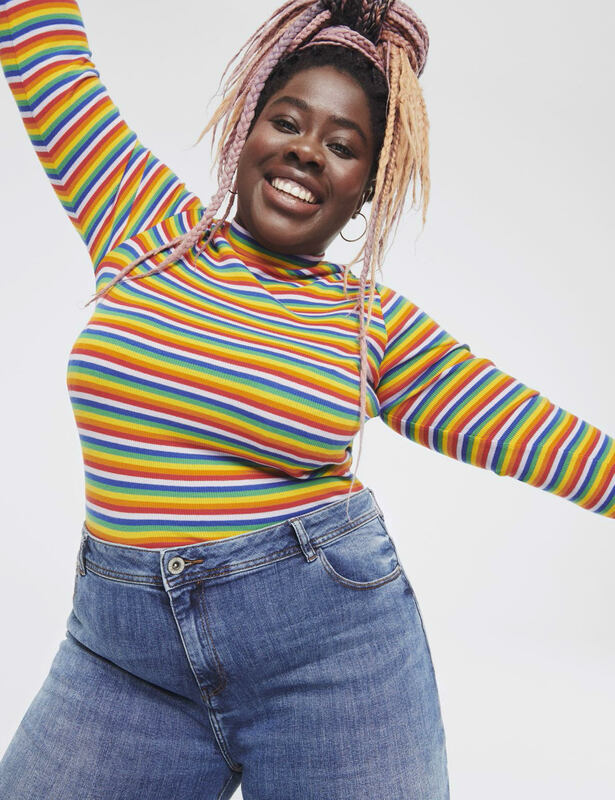 Until that moment none of it really seemed real, that someone like me, a plus-sized dark-skinned black woman, would feature in one of the nation’s best selling women’s magazine. Before then, I was in disbelief that someone would look at me and think I was worthy enough to be in a magazine. Indeed, when I later told some people that I was in Cosmo, they looked me up and down, seemingly confused why I of all people would be chosen to feature in a campaign. Yet their looks didn’t phase me like they normally would. Since primary school I have always felt I looked ugly, and despite my parents saying I was beautiful, my friends saying I was beautiful, and even the team at Cosmopolitan saying I was beautiful, I never believed them. It’s sad that it took me so long to believe I was beautiful, and I still do have a long way to go on my self-confidence journey. This was a lesson for me in seeing myself the way those who value me do. However, I truly believe this is a lesson every woman, particularly every woman who doesn’t fit into the archetypal Western vision of beauty, can learn from. It’s ok to be you, it’s ok to be different, and if those who love you tell you they love you – whether that be for your looks, your personality, your intelligence etc… – maybe, just maybe, you should let yourself believe them.